User interface designer David Sheldon Hicks explains how weather maps inspired the design for Jupiter Ascending's computers. The Wachowskis' sprawling new interstellar flick Jupiter Ascending hits theaters in the U.S. today, bringing with it VFX house Territory Studio's larger-than-life screen graphics and user interface designs. The film's narrative jumps between different cities, spaceships, and planets, lending it the grand scale of previous Territory projects including Prometheus and Guardians of the Galaxy, so the group had ample opportunity to augment the film with meticulously crafted computer screens, ship controls, and more, which you can preview in the video above. 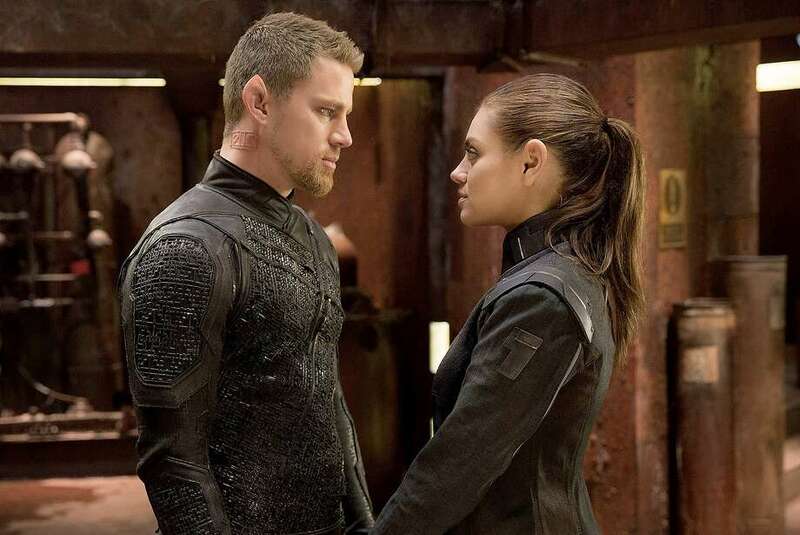 Jupiter Ascending's momentum is driven by wormhole techology, which lets genetically-engineered warrior Caine Wise (Channing Tatum) whisk protagonist Jupiter Jones (Mila Kunis) away from Earth and into the political machinations of galactic royalty. Territory's creative director, David Sheldon Hicks, wanted to firmly root these inconceivable machines in the realm of reality, so he and production designer Hugh Bateup devised a system of rules and graphics based on the rich world of weather map design. "The iso[metric] lines in weather maps are normally used to describe weather fronts." Hicks tells The Creators Project. "[Bateup] liked the idea that they represented gravity or other invisible forces that the alien characters knew how to read." Hicks, who previously wrote an in-depth explanation about interface design's importance in visual storytelling on our site, gave us a litte bit of insight into Territory's work for Jupiter Ascending, and what it was like working with the Lana and Andy Wachowski. The Creators Project: Give me a brief rundown of the devices you're designing interfaces for in Jupiter Ascending. David Sheldon Hicks: We were mostly involved in the computer screens in the bridge of each ship. These screens weren't the usual rectangular format, but were actually wedge shaped glass panels with our graphics being rear projected onto the glass. Some of the panels had geometric designs etched onto them as well, so that our kinetic projections mingled with physical glass etchings. It turned out to become a clever merge of 3D set design and animated projections. How does your interface work characterize and contextualize the wormhole-generating machine? We knew that there would be use of wormholes and folding space and the screens would need to depict this in some way. The production designer Hugh Bateup liked the notion of 3D weather maps. The iso lines in weather maps are normally used to describe weather fronts, but he liked the idea that they represented gravity or other invisible forces that the alien characters knew how to read. Using those organic forms we could reveal ships de-cloaking or the fabric of space being folded to create a wormhole. What were your biggest influences in designing Jupiter Ascending's interfaces? With user interfaces and screen graphics in films we’re always trying not to repeat ourselves. That can be tricky when we need to ground an element of what we do in reality, so that it still reads as a computer interface. To do this its important that our mood boards and initial references aren’t referencing other UI or film UI, but broader inspiration. In this case Hugh provided that great spring board, the weather maps, which we embraced and explored through multiple animation tests and explorations. When we started running the simulations we started to notice other happy accidents, which we tried to retain in the work. On some of our other projects simulations in 3D can often be tricky to control, but in this case we embraced that random process. It was almost run as an RnD project where we tried lots of new techniques, and encouraged errors in the process. We could simulate particle streams tracing over the surface of a ship, like in a wind tunnel, and each time we’d receive different results. How was working with the Wachowskis different than working with Ridley Scott or James Gunn? I think initially the Wachowskis assumed all graphics would be green screen and inserted after everything had been shot. In talking to Peter Walpole (set decoration) and Mark Jordan at Compuhire we thought we should try some tests, rear projecting onto the glass panel screens. We’d done something similar on Prometheus, so we were confident it could be achieved. When the directors saw the tests, they wanted it on everything! They were a delight to work with and got really energised by working with us on-set. Our senior motion designer Nick Hill and motion designer Ryan Hays would be perched with laptops, designing,animating and rendering literally as Mila and Channing were being shot. Lana and Andy would take a look and then get us to make changes on the fly for the next take. It was a demanding way of working, but a lot of fun (easier for me to say than Ryan and Nick!). What was the most challenging device to design interfaces for? The irregular shaped screens that were tilted at angles were pretty tricky. We wanted animated graphics to be placed perfectly, running along angled edges. The screens though were tilted so that they weren’t 90 degrees to the lens of each projector, essentially warping the projected image on the screen. Through trial and error we figured out a distortion within After Effects to compensate. We were inverting the distortion that was physically happening on set and it worked so well that we now use this technique on other productions. What is your favorite interface in Jupiter Ascending? Why? The isometric lines were used throughout all the screens as an animated piece of content and I personally feel that they hold up as a piece of data design but also as an iconic visual element for the film. We’re all huge fans of the Matrix films at Territory. The screens in those films are incredibly iconic and serve as a lens into a virtual world. Our hope and intent was to provide the directors with a similar graphic language that both functioned as a screen graphic but also as a representation of how people/aliens understand the world/universe around them. See more of Territory's impressive design work on their website, and read David Sheldon Hicks' discussion of interface design here.